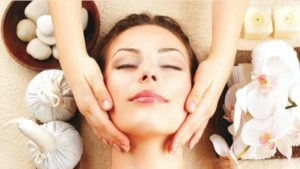 Each facial is customized and includes, skin analysis, cleansing ,ozone steam, exfoliation, facial massage, masque ,serum, moisturizer, eye treatments and face care lotion will all be customized to suit your individual skin type . And finishing product. Also scalp, neck, shoulder, leg, massage. Please Note: Couples facial (side-by-side) NOT AVAILABLE to book online. Please call the Clinic at (587) 425-0074 or contact us via our online form to request this type of appointment. A great facial for a general pick-me-up, or if its been a while since you’ve had a facial. Completely customized from start to finish based on your skin type. This treatment will leave you feeling fresh and vibrant! Traditional Thai Ingredients promote the health and breath ability of the skin while Thai Massage Techniques are used to gently promote the natural smoothing and lifting of the skin. A signature facial pouch filled with detoxifying Thai traditional healing herbs for face, this is a natural highly effective skin treatment to reduce fine lines and wrinkles without chemicals. Repair and anti-aging with high concentrations. This softens the complexion and minimizes the signs of fatigue, dehydration and aging. To refresh you facial with almonds, oats and oat bran, green tea cleanser, gentle exfoliation to remove dead skin cells. Relaxing facial massage, freshest cucumber mask to tone and shrink skin pores while purifying the skin, acts as a revitalizing agent. A luscious, relaxing facial customized for any skin type. This facial uses powerful medicinal herbs antioxidant and natural nutrients to address skin texture. Organic ingredients to deeply cleanse, exfoliate and hydrate the skin. A lymphatic facial massage is administered to improve blood circulation and help achieve firmer skin. A deep cleansing facial personalized for Men. A rich blend of plant oils is used alongside natural antioxidants derived from Witch Hazel, Grapefruit and Green tea to cleansing and exfoliationhelp regulate sebum production. Session ends with a scalp massage and hand massage for a com plete care. An intensive facial to treat sun damaged and nutrient deprived skin with antioxidants derived from Carrot Root Extract, Evening Primrose. This facial improves skin firmness, minimizes pore size and leaves skin radiant. Finishing touch includes wrinkle softening cream to soften appearance of fine lines.